In my every day cooking I rarely follow a specific recipe. That is how women in my family have always cooked. Growing up I was involved in the kitchen a lot: first as a dishwasher (who could have known that you are supposed to wash both sides of the plate ?! ), and then as an assistant chef. My first independent cooking project was an egg, onion and pickle salad, which my parents *said* was great. I wanted to share my process for selecting and cooking dishes without using a recipe. Though I do use complete recipes occasionally, it is rare that I have all required ingredients on hand. That’s not a problem! Substitute similar ingredients for the ones called for in a recipe, sticking to the same basic food category. : green beans for asparagus, yogurt for sour cream, black beans for kidney beans, etc. 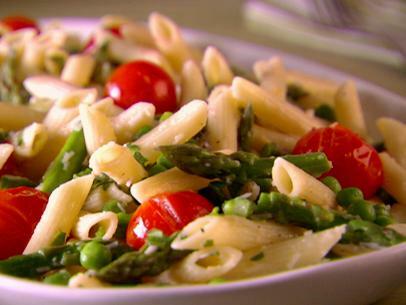 Example: this pasta dish, where I used green beans instead of asparagus. I eye-ball ingredients all the time. Have you noticed how celebrity chefs pour oil straight from the bottle and say, “Add about 2 tablespoons of oil”. The fact is that if you end up pouring 2 and a quarter tablespoons of oil, it is not going to mess up your dish. Bottom line: it is rarely necessary to keep exact measurements while cooking (this is my opinion and I am sticking to it). If I am pressed for time and have no plan for a dinner, I rely on fridge/freezer and pantry staples, and put together a dish based on this formula: lean protein+ veggie side+ grain. *salmon patties (canned salmon), steamed broccoli/green beans (frozen), brown rice (boil-in-a-bag)/couscous. *quesadillas: mushroom and onion, cheese, bean and cheese, chicken (using leftover cooked chicken that I stash in the freezer). *Italian sausage (frozen, defrosts in the microwave in minutes), pasta/ravioli, salad. *Shrimp (frozen, defrosts in a bowl of luke-warm water in minutes), sauteed bell peppers and onions, grits. Tip: preparing spontaneous meals think a theme: Italian, Greek, Asian. This helps to pick out ingredients that will work well together. When I come across an interesting recipe, I like to make it my own by adding to it based on what I have in the fridge, what I feel will go well with the original recipe (see Tip above), and based on our preferences. Herbs, beans, veggies, cheese make great add-ons. By the same token, I sometimes omit or cut down on some ingredients (usually fat and sugar) when I feel like the final result will not be affected negatively. It is helpful to know a few basic rules to abide by while cooking, to make sure you don’t end up with a total flop (been there, done that). But my most favorite rule is: there are NO RULES! You are the boss, and your dish will come out unique and edible delicious. It may take a bit of practice, but it will give you freedom of being able to cook on the fly, and avoid take-outs and pizza delivery. What is your cooking style? 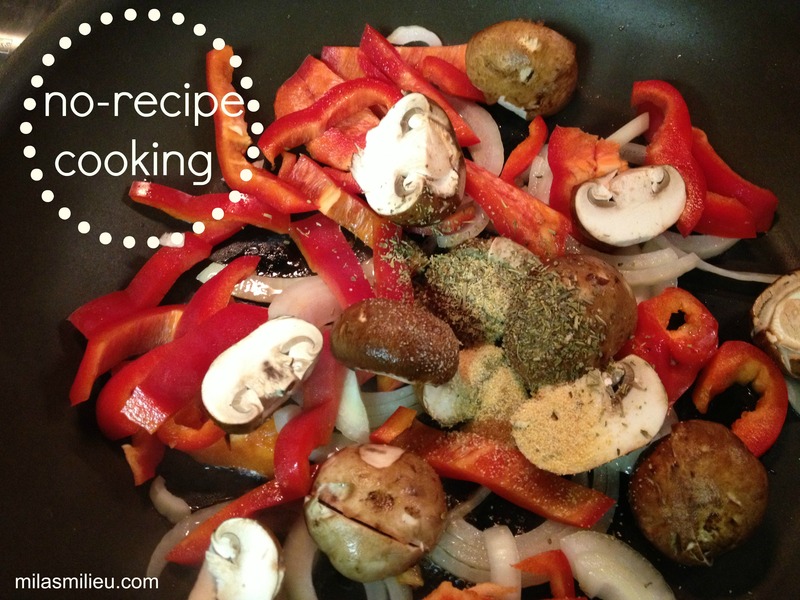 Do you feel “safe” or stymied by using a written recipe? Did you find these tips helpful? Share them with your friends using the buttons below! I am definitely not a “wing it” cook! I admire people who are, but I need a recipe in front of me! I think that’s why I like baking so much, because it is precise. That’s true that baking requires a lot more precision! Though for something that I bake a lot, like muffins, I sometimes eye-ball too. I think I am just too lazy and/or impatient to measure. I tried two of your recipes, Amy, and both were delicious (frittata and “zookini” cake). I have become a much more fly by the seat of my pants kind of cook. Which I actually like, it keeps things flexible. I think the longer you cook the easier it is to be able to do this. Great tips! Yes, Morgan, I think flexibility is the best part of no-recipe cooking. And definitely “practice makes perfect” (or just good enough). I like to think that I have an option of throwing something healthy together, instead of ordering a take-out or going out to eat.